. 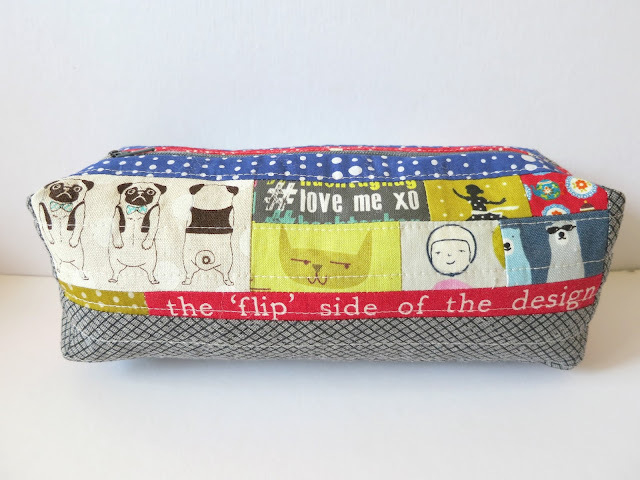 : iFussy Cutters' Club blog hop stop :. Hi hi hi, it's been a while, more on that right down the bottom*. 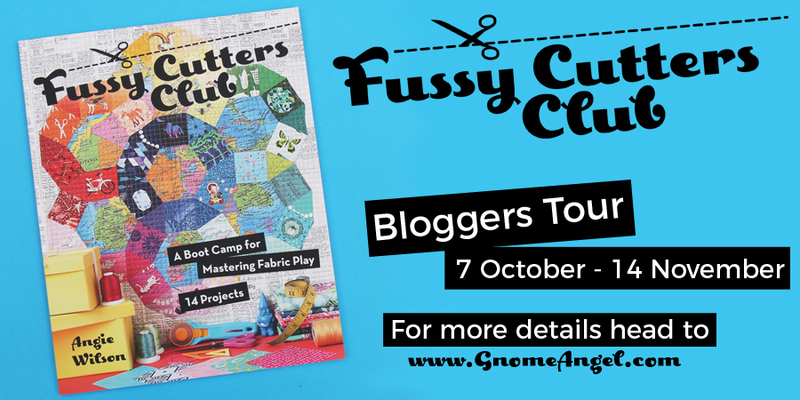 I have the happy good fortune today to be part of my friend Angie's blog tour for her wonderful new book Fussy Cutters' Club - A Boot Camp for Mastering Fabric Play. You can click through and read Angie's post launching the book here. I'll wait. Fussy cutting has long been my main love about sewing - it's so fun to personalise projects and gifts using 'just the right' fussy cut motif. Angie's book has 14 fabulous + fun projects, as well as a huge amount of really helpful technical info that will guide you through the fussy cutting process. There are projects for beginners and the more advanced fussy cutters amongst us. 2. Angie had chosen to use a precious Aunty Cookie for her pouch! - total no brainer. 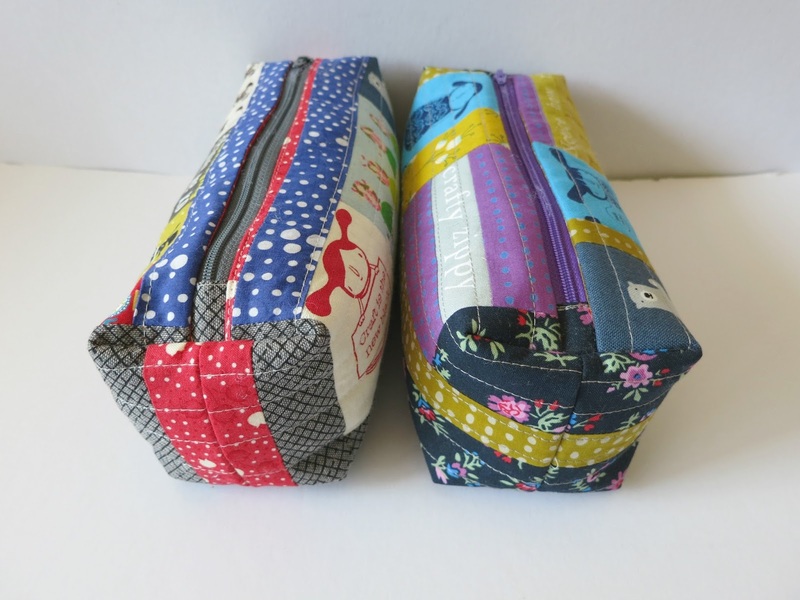 I loved Angie's pattern and her use of Aunty Cookie so much, that I went ahead and made TWO pouches, BOTH with an Aunty Cookie! Here is Angie's pouch from the book. Isn't it fabulous! - and just quietly, 'make quilts not war' - excellent suggestion. Angie's instructions for the pouch are really clear, and broken down into plenty of steps. Just be sure to read through everything first, and go slowly through each step, as the construction of the pouch is unlike any zippy I have made before - so intriguing! 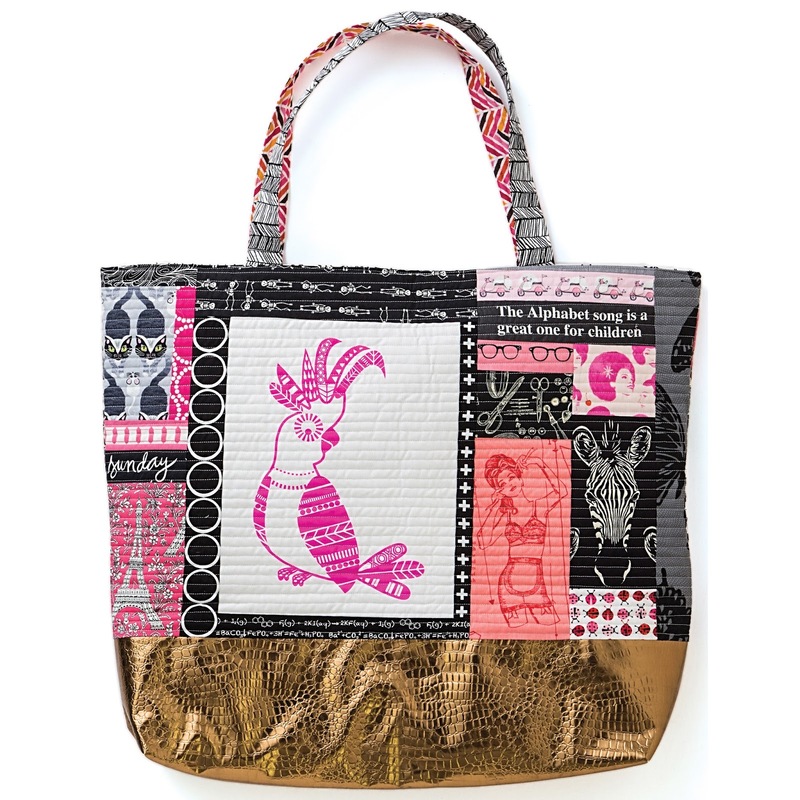 The pouch is a fun way to showcase a combination of favourite fabrics, from the very tiny to the marginally less tiny. I can never have enough fussy cut words, and this project is perfect for them. 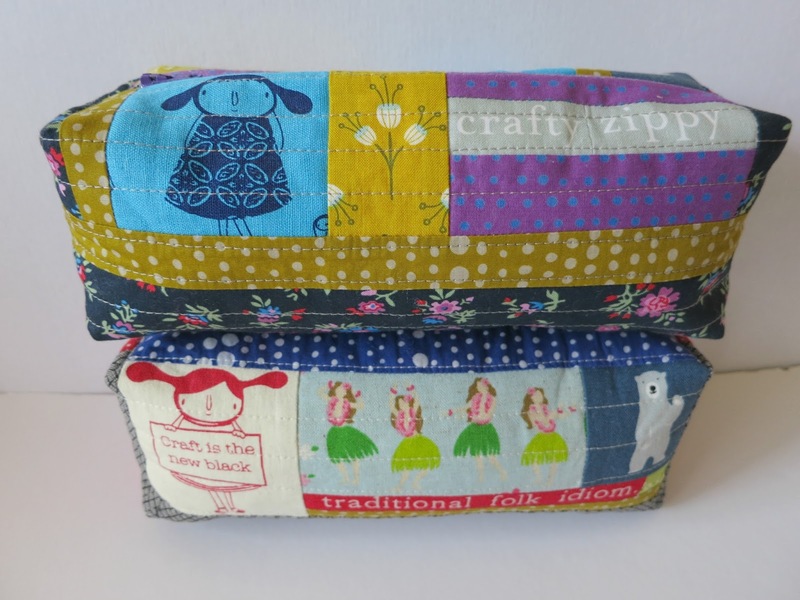 'Crafty zippy' below is from Berene Campbell's HappySewLucky shop on Spoonflower - it's called 'improv adjectives'. Another fun little part of Angie's pattern, is that you can change the look of the ends of your pouch, depending on how you sew your fabrics together. That's a neat little trick, don't you think? And my one little hot tip for when you make your own '1-2 Sucker Pouch', is to sew around any 'internal' raw edges you create as part of the pattern. I could not end my hop stop without sharing Angie's pic of 'Totes Amazeballs', another awesome project from her book. Along with some spectacular smaller fussy cuts, it features Vee and my 'Priscilla, Queen of the 'Burbs' screen printed cockatoo panel. We are both really thrilled and honoured that Angie chose to use Priscilla in such an amazing project AND that she included it in her book! Thanks so much for stopping by to share in the '1-2 Sucker Pouch' fun. Angie has created a website for the book to help provide you with all the information you need - head over to Fussy Cutters Club - there are gorgeous pics and links to create your own fussy cut world, and more importantly, the link you need to purchase your own copy of Angie's book. I can't wait for mine to arrive, I am checking the letter box every day! Please scroll down and get clicking to see the very sweet projects that some super talented peeps have made (or are still making!) as part of the blog hop. 12 October Kerry from Kid Giddy + a giveaway! 16 October Molli Sparkles + a giveaway! 24 October Bernie from Needle and Foot + a giveaway! 30 October Sandy from Upstairs Hobby Room + a giveway! 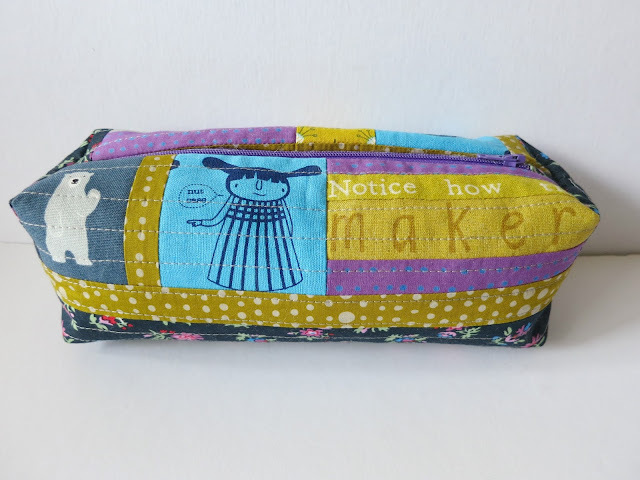 1 November Raylee from Sunflower Stitcheries + a giveway!
. : Farmer's Wife sew-along block 91 Sarah :. Here is Sarah. 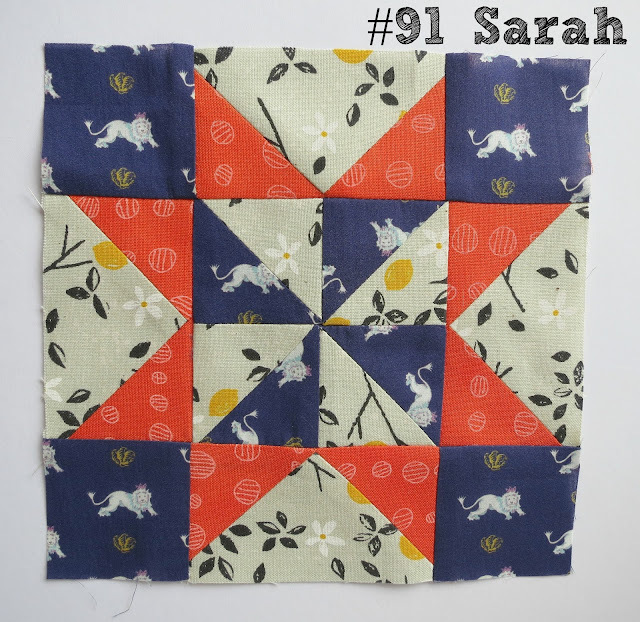 Sarah was the most straight-forward of all my Farmer's Wife tutorial blocks to sew - there is a not a y-seam in sight! 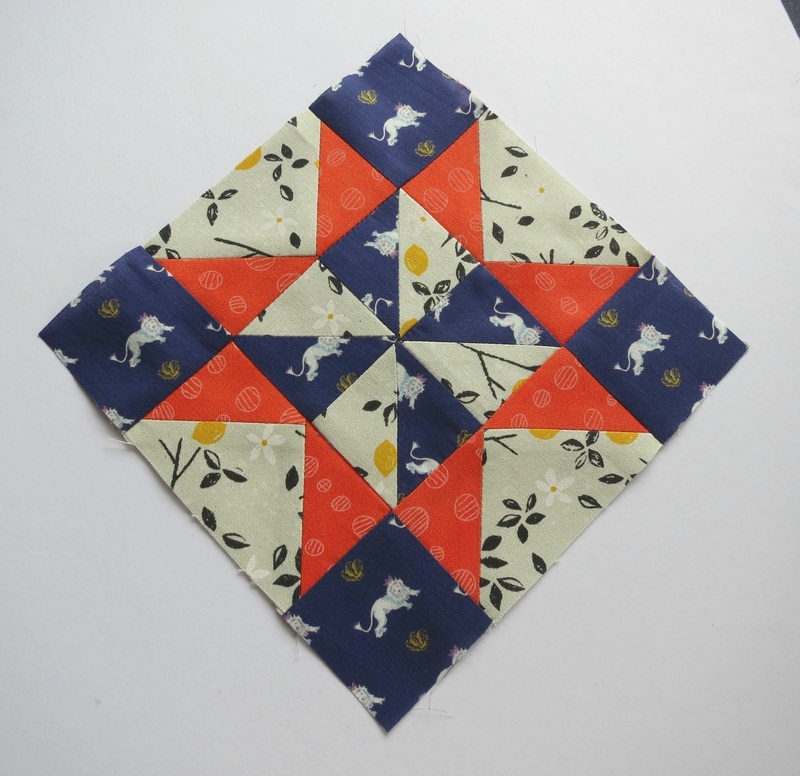 You can sew Sarah without foundation paper piecing or templates - I rotary cut all the pieces, and worked out the quilt-maths to make the HSTs and flying geese star points all by myself! - which is a pretty massive achievement, as quilt-maths and I are not friends. As you know, I cannot share the measurements here as it would breach the author's copyright - but if you can figure out the size of the corner squares, knowing that the unfinished block is 6 1/2" square, you'll be off and running. 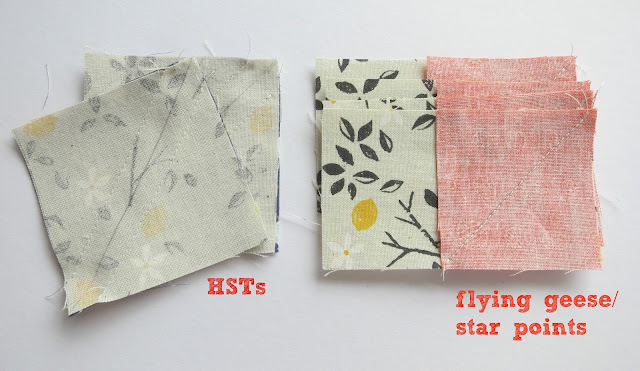 For HSTs - click through to Alyce's very helpful tutorial. For flying geese - click through to this Quilter's Cache tutorial. Of the three different methods shown, I like their 'Speed Piecing Method A' the most. 3. Flying geese (star points). 2. Four flying geese bases. 1. Eight squares for flying geese star points. 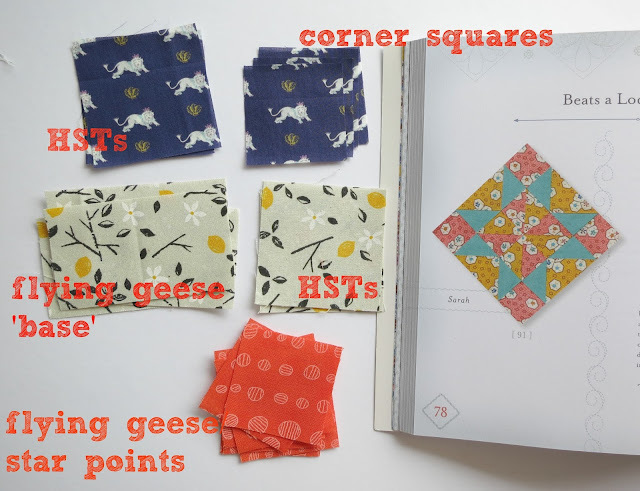 Once you have cut all your fabrics, you will need to rule a diagonal line - I always just use a sharp pencil - on the back of all eight of your flying geese star point squares; and on the back of your two low volume HST squares. To create your HST units, place your low volume + print squares RST, then sew 1/4" either side of your drawn line (refer to the pic below - you may need your glasses or to zoom in, as yes, I realise now it would have helped significantly if I had thought to use a higher-contrast thread for these tutorial photos). To create your flying geese units, place one star point square on one flying geese base, with the diagonal drawn line running from a top corner to the bottom middle, as pictured below. Sew directly on the drawn line. - for the HST units, trim directly ON the drawn pencil line. You will have four HST units. Iron the seam open. Trim each HST unit to the same size as your four corner squares (the navy lions in my block). 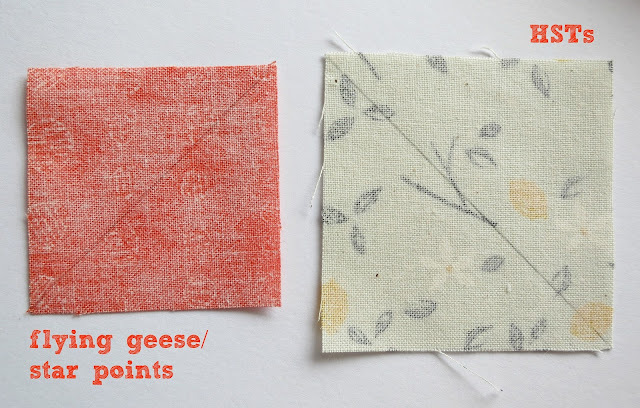 - for the flying geese units, trim 1/4" from your sewn line, being sure that you are trimming off the small outer triangles and not the flying goose base (in the pic below, you would place your 1/4" ruler line directly on the sewn line, with the outer edge of the ruler running 1/4" from the sewn line down to the right underneath). Iron your seams open. Place your remaining four star point squares on the other end of your flying geese units, with the drawn line running from the top corner to the bottom middle, as shown in the pic below. Again sew directly on the drawn line. Trim 1/4" from the sewn line, being sure to trim off only the small outer triangles. Iron your seams open. 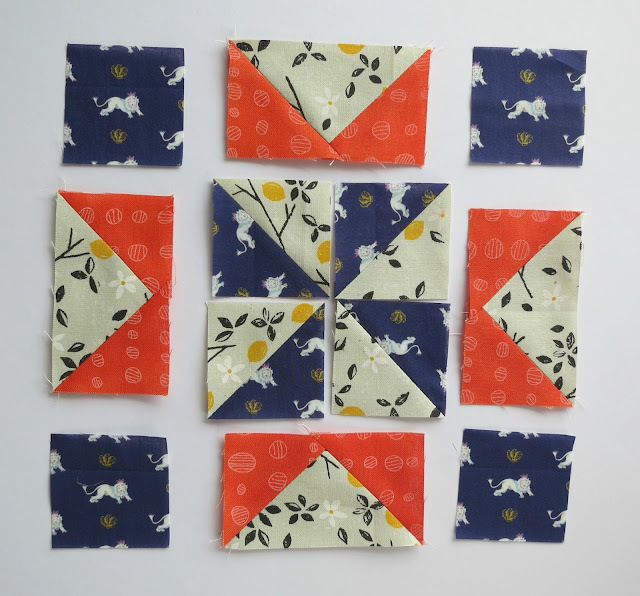 Lay out all the units of your block as they will appear in the finished block, taking particular care with any directional prints, and ensuring that the fabrics in your central HST pinwheel are correctly oriented. Sew the HST pinwheel together - join the top squares + bottom squares - this is one of the few times I iron seams to either side, to make sure the seams nest nicely when sewing the pinwheel together. 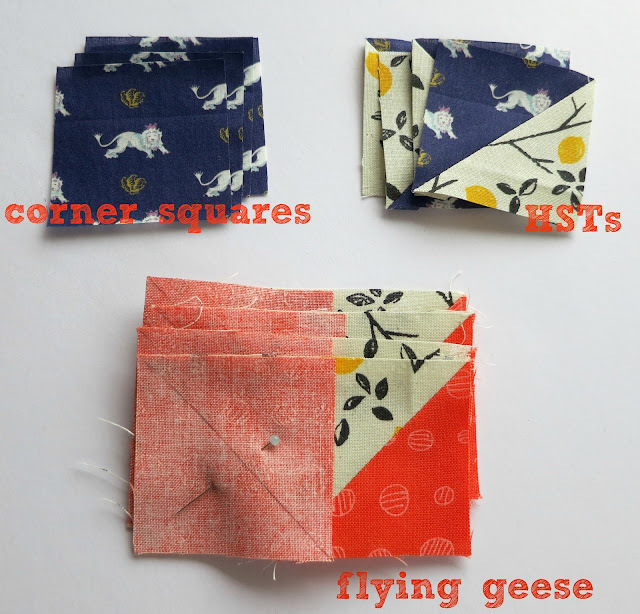 Sew your corner squares to the top and bottom flying geese units - iron the seams to the corner squares. Sew your flying geese units to the central HST pinwheel - iron the seams to the pinwheel. Sew your three rows together, taking care to match up your seams. Good luck with your Sarah - she is a dream to sew. 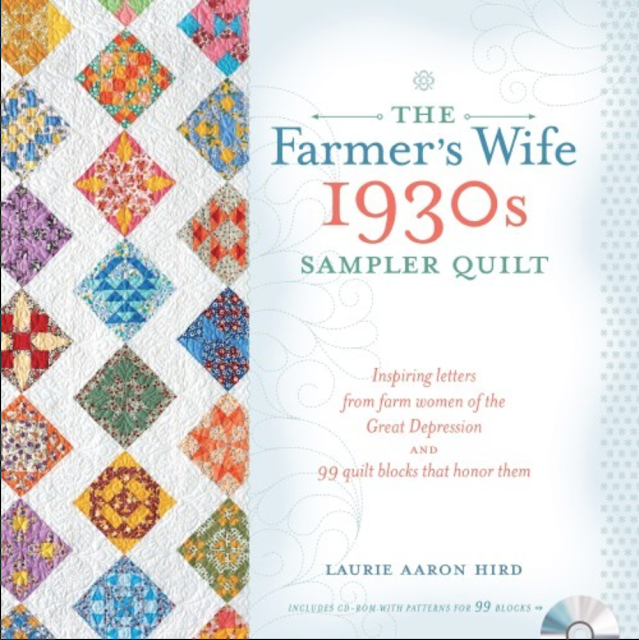 The book you will need for the Farmer's Wife sew-along is The Farmer's Wife 1930s Sampler Quilt: Inspiring Letters from Farm Women of the Great Depression and 99 quilt blocks that honour them by Laurie Aaron Hird for Fons & Porter/F+W; RRP $28.99 - click here to purchase. For all information about the Farmer's Wife sew-along, please click through to Angie's GnomeAngel blog - she has a separate tab for all the Farmer's Wife info, as well as a whole heap of info for her 2017 sew-alongs - it's definitely worth taking the time to make a cup of tea and have a good read through everything. And if you would like to sew Sarah using Marti's fabulous templates, please take a click through to Marti Michell's blog for all the info.
.: Farmer's Wife sew-along block 84 Posy :. Hello Farmer's Wifers, it's Posy time. I liked making Posy. My last Farmer's Wife block tutorial was for block 87 Prudence, who is still no friend of mine. Like Prudence, Posy involves y-seams but they are much gentler. Posy is definitely a much happier block to sew. 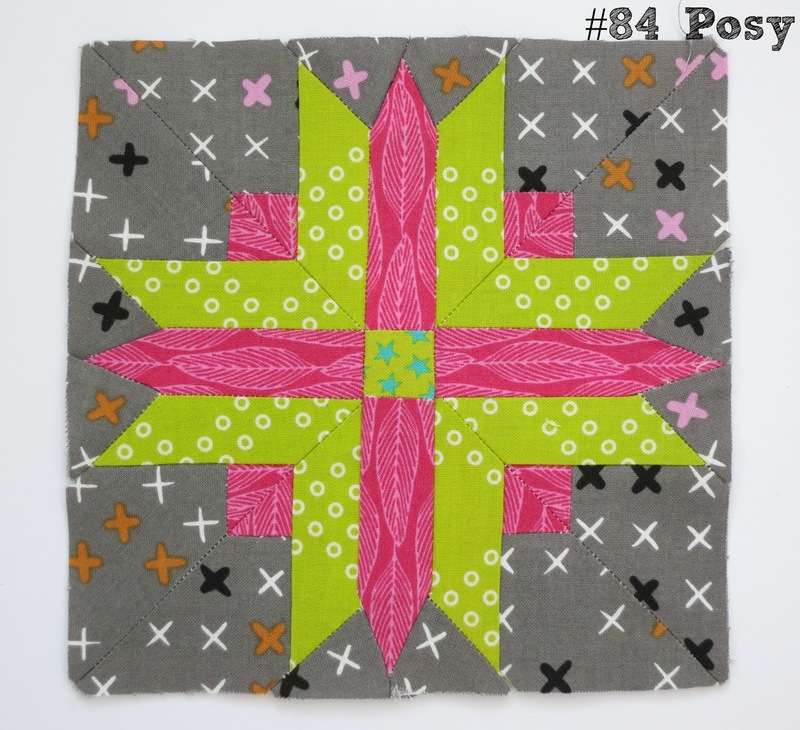 My tutorial is for foundation paper-piecing (FPP) Posy. I created a FPP tutorial for block 1 Addie, and have decided to create nearly-a-full FPP tutorial for Posy too (there aren't as many step-by-step pics for Posy as there were for Addie, so please click through to Addie if you need more detailed info). 1. The first step is to print off your templates, being sure to have your printer set to 100% (or 'no scale'). Check the one-inch line with a quilting ruler. 2. Decide on your fabrics and colour in or label your block diagram and the corresponding template pieces, so you can keep track of which fabric to sew onto which template piece once they're all cut up and don't make a lot of sense - I forgot to take a block diagram + fabric choice pic of Posy, so see below for a pic of Prudence (so nice of past-Prudence to step up and show a bit of kindness). 3. Use paper scissors to cut out all your template sections, just roughly around the outside, there's no need to cut directly on the dotted outside edge (note that the solid line is the line on which you will sew, and the dotted line is the outside edge, with the seam allowance in between). 4. Work through all your template sections, and glue the first fabric piece onto the first template piece. I use a swish of Sewline glue pen to glue the wrong side of the fabric to the unprinted side of the paper template. To be sure you are gluing the fabric in the correct place, hold your paper template up to the light (a window or a light box if you have one) and position the first fabric piece over the first template piece, being sure to leave a 1/4" seam allowance around all edges of the template piece. 5. Work through all your template sections again, carefully pinning your second fabric piece in place. Place your second fabric RST (right sides together) with your first piece, with at least a 1/4" seam allowance extending into the template's second piece. Pin in place along the sew-line between the first and second template pieces, then flip your second fabric piece over to check that it covers the whole area plus seam allowance. 6. Take all your template sections to your sewing machine. Set the stitch length to 18-20 stitches per inch for your machine - on my Bernina, it's 1.5. I sew all my FPP blocks with the Bernina 1/4" number 37 foot - you need an open-toe foot of some kind, so you can easily see where you are headed. 7. Sew directly on the printed sew line. Be sure to backstitch at the start and end of your sew line. For sew lines that start/finish within the block, be sure to start/stop directly on the sew line. For sew lines that start/stop on an external edge of the block, it's fine to sew into the seam allowance (doing this just makes removing your papers later a little more fiddly, but it makes your block a little more secure). 8. Once you have sewed the second piece to the first piece on all your template sections, take the sections to your cutting mat and lay them fabric-side down, being sure that your fabric pieces are still RST, and haven't flipped over - you don't want to trim off the piece you have just sewed. Fold template piece 2 down onto template piece 1, along the line you just sewed. Line the 1/4" line of your ruler directly along the fold line, and trim your seam allowance to 1/4". Do this for all your section pieces, and then take them to the ironing board. Note that for the trimming step of all FPP patterns, you will always fold down the bigger template number onto the smaller template number, to trim the seam allowance - so be sure to always follow the numbered piecing order. 9. Flip over and press your second piece down flat - be sure to press down rather than swoosh the iron all about, so your fabric pieces don't shift. 10. Repeat steps 1-9 until all your template sections are finished. 11. Once all your sections are finished, press them flat with the iron, then trim around the external edges, directly on the external section lines - refer to the pic below under step 12. 12. Now to join the sections together. 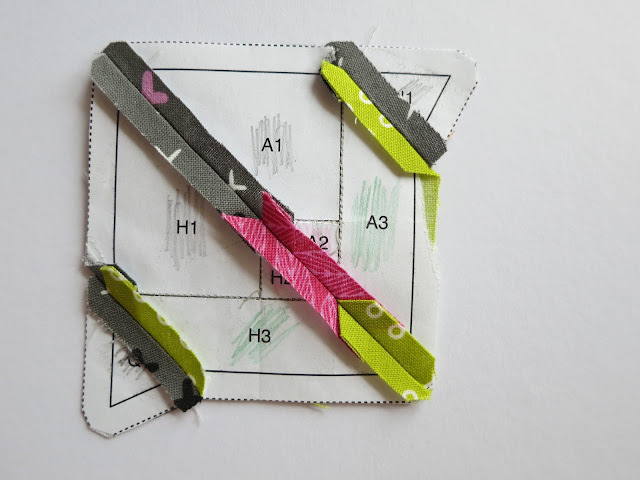 To be sure your template sections meet up correctly, place pins through external sew line meeting-points - refer to the pics below as an example (joining section A to section J). 13. I then pop a Wonder clip or two between my pins, so that the section pieces can't move. 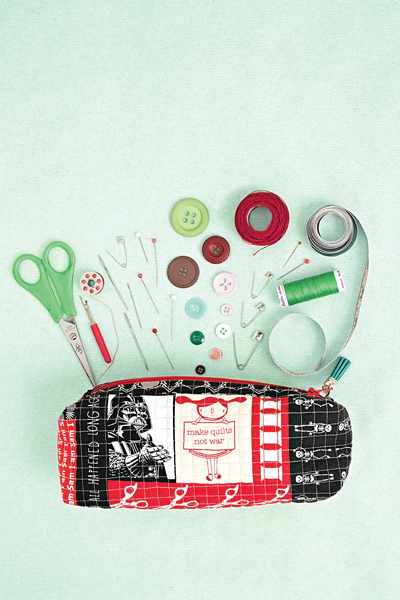 Remove the pins + clips as you join each section together, sewing from paper-edge to paper-edge along the sew line. 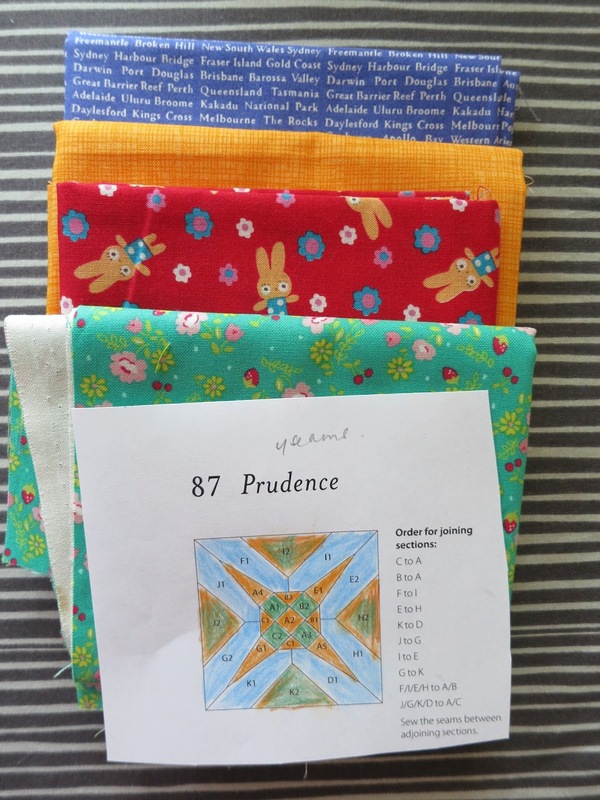 As with all FPP patterns, follow the piecing order given in the book. Just note - when joining the little triangles J-Q, be sure that all the letters read the right way up, then flip the little triangle over to join to the bigger piece (e.g. K to B in the pic below - see how all the letters + numbers are running in the same direction). Add extra pins along the sew line as needed, to help the sections meet accurately - see pic below, where I have added pins either side of A2, as well as on the outer corners. 14. After you join each section to the next, iron the seams open - you can remove the paper within the seam allowance at this point. - continue sewing along the smaller line to the paper-edge. It totally works fine, I swear! - just go slow and steady. 17. Take care when joining the top and bottom sections to I, as the fabric on the outer tips will want to shift - I used my Sewline glue pen to swish glue on the outer tips of I1 and I3, to ensure the fabric did not lift away from the paper as I sewed. 18. I'm not the world's best y-seam sew-er, so to make life easy, I started right in the middle of I2 and sewed out towards the end of I1, then followed the same steps within step 16 above to sew to the outer edge. I then repeated it all again to sew from the middle of I2 (overlapping my stitches a little) to sew to the outer edge of I3. 19. Press your seams open - and you are done! - hopefully all your seams will have matched up happily. You have finished Posy! - block 84 is done. Remember that all the Farmer's Wife info is on Angie's blog - which is home base for the sew along. The book you will need is The Farmer's Wife 1930s Sampler Quilt: Inspiring Letters from Farm Women of the Great Depression and 99 quilt blocks that honour them by Laurie Aaron Hird for Fons & Porter/F+W; RRP $28.99 (though it's currently on sale!) - click here to purchase. 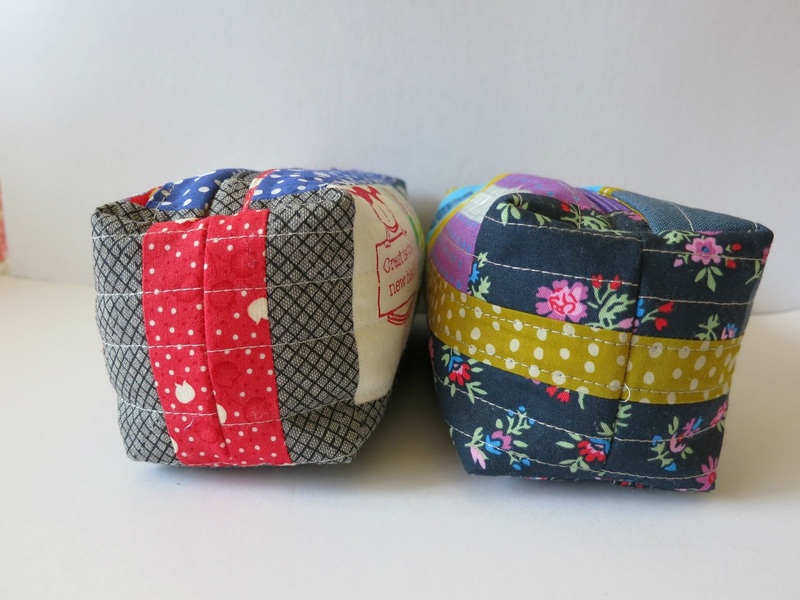 Did you see that Angie sewed an alternate to Posy this week? - block 84a Ruth - using Marti Michell templates (to avoid sewing a FPP y-seam block) - so if you'd prefer to sew Ruth instead of Posy, please click on through. Angie's post includes the links to Marti's chart + template info. Angie's post also includes all the upcoming blog links for the remaining blocks - we'll be starting back again in the new year. Please link back if you use any catandvee content from anywhere online. © cat&vee 2011. All rights reserved. Simple theme. Powered by Blogger.